Central Park is in the heart of Old Louisville’s historic preservation district, at Fourth and Magnolia streets. The amphitheater seats up to 1,000 attendees, and additional seating available on the lawn and at the rear of the amphitheater on bleachers and picnic tables. Beneath the canopy of trees, with a bourbon and some delicious food truck food and desserts, it’s a terrific night out. Adding to the exciting entertainment, every night a different community group performs pre-shows before the main production. A few changes have been updated this season.This year they have added two “Bard-A-Thon Saturdays”, and July 21 is the second one. One play is at 8 p.m. and another at 10:30 p.m. 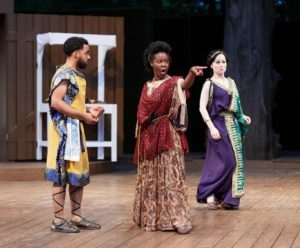 They also have Cincinnati Shakespeare Company coming down to present their own performance of “A Midsummer Night’s Dream” and the Louisville Ballet with a world premiere of “The Tempest set to dance.” The dramas are presented every night, Tuesday through Sunday. At the festival’s website, kyshakespeare.com, a full schedule in available. There is parking available all around the park on Fourth Street, Magnolia, Sixth Street and at the park. The festival partners with local vendors to provide food and drinks before and during performances.